The basic tenet in our treatment of cortical histology is the following. 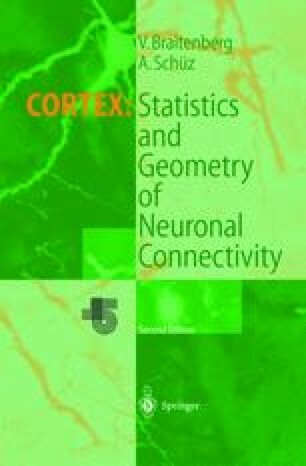 We believe that important insights in the nature of the cortical network can be gained by the quantitative comparison of statistical measures such as the density of various tissue elements (number of neurons, synapses, dendritic spines per unit volume, total length of axons and dendrites per unit volume, average range and distribution of axons and dendrites around the neurons) even if the detailed pattern of the connections is not known. Before we can show this (Chap. 13), we must present our measurements in some detail. Because of the importance of densities in our quantitative description, some preliminary technical comments are in order, referring to shrinkage which may arise in the histological procedure, and to the general difficulty of assessing densities in the volume from measurements which are by necessity performed on quasi two-dimensional sections.